This article originally appeared on Seeking Alpha on October 27, 2016. Verisk Analytics provides insurers and businesses with sophisticated risk analysis services and software. Aggregating and interpreting massive amounts of data is on the leading edge of technological innovation. A foray into the energy industry and challenges in the property & casualty markets present headwinds. Economies of scale and an entrenched user base ultimately present long-term rewards for investors. I struggle to justify current market valuations, and my articles have been mostly bearish. It’s unusual for me to recommend an investment, but I believe Verisk Analytics (NASDAQ:VRSK) has a business model which is too good to be ignored. In spite of vast improvements in mobility, connectivity and automation, economists have been puzzled by the lack of productivity growth over the past 10 years. The naysayers point to social media as nothing more than a distraction. The optimists believe the innovations of the recent past will soon appear in productivity statistics as the benefits proliferate. One of the key sources of projected growth is the ability of technology to analyze streams of vast amounts of information in order to detect patterns or hidden anomalies that may lead to better decisions and efficiency. From human genetic material to battlefield simulations, big data is becoming big business. An investment in Verisk could be one way to participate in the profit opportunities buried in the sophisticated analysis of mountains of data. 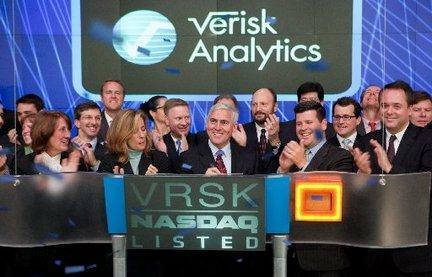 Verisk Analytics, based in Jersey City, operates in markets throughout the world. At the recent price of $82 per share, Verisk has a market capitalization of $2.27 billion on $2.0 billion in revenue. The company was formed in 1971 to provide as a resource for insurance companies and regulatory bodies to provide and share information on property and casualty insurance claims. Insurance companies were the initial stakeholders in VRSK, and a 2009 IPO allowed them to liquidate their holdings. Interestingly, Berkshire Hathaway (NYSE:BRK.A) (NYSE:BRK.B) is one of the few insurers that have retained their position. Verisk is a key provider of risk analysis solutions. Property and casualty insurers confidentially share their data and Verisk aggregates the information. In turn, VRSK provides complex models on weather patterns, building losses, catastrophic scenarios and other hazards. Verisk also provides risk analysis solutions and software to the financial services, defense, entertainment, retail and food industries. Importantly, the company entered the energy industry in a big way during 2015 when it acquired Wood Mackenzie, a UK-based provider of analysis tools for the hydrocarbon industry. Verisk has grown revenues and EBITDA by double digits on a compounded basis over the past five years. With over 7,000 employees, it has a global reach. Most importantly, it has a treasure trove of data that is continually updated and expanded. The economies of scale are immense. Risk analysis is becoming more essential as volatile political, macroeconomic, and geological challenges become increasingly complex. For example, the host of cataclysmic meteorological impacts upon lives and property will continue to increase as global warming persists. Does your company need to know the possible effects of a pandemic or terrorist attack? Verisk will tell you. VRSK lists 29 of the largest 30 insurers as clients. Verisk recently expanded into the energy data business with its Wood Mackenzie acquisition. It purchased the business during the lowest points of the oil market collapse in 2015, leaving the company poised to benefit from a rebound in crude exploration. 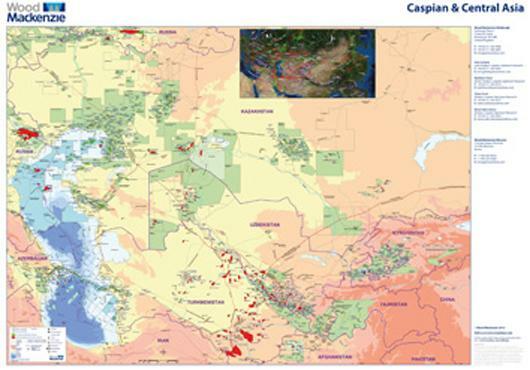 Not only is the science of oil discovery evaluated, but also its expertise extends to geopolitical risk assessment. The company also divested its healthcare analytics business in order to profit from its primary expertise in the physical environment. Leadership has recently been solidified: Mark Anquillare was named as COO and Eva Huston was promoted to CFO in May of 2016. Management is proud to mention the strong profitability at VRSK, with EBITDA margins over 49%. Free cash flow has consistently risen and will allow VRSK to pay down debt and continue to expand through future acquisitions. VRSK has some hurdles. Property & casualty insurance markets are under pressure. Loss ratios have been rising and investment income has dwindled. Verisk earns about 75% of its revenues under long-term contracts, so it does not face a sudden loss of business. However, insurers will likely seek to reduce costs in the years ahead and service vendor contracts will certainly be vetted. On the other hand, a challenging underwriting environment may only reinforce Verisk’s position by providing insurers with a competitive advantage. Any tool to help mitigate losses should be welcomed by the casualty insurance sector. VRSK is now highly exposed to the UK pound sterling through its Wood Mackenzie energy subsidiary. The 15% decline in the pound since the referendum vote will be a drag on revenues. Energy clients may ebb and flow more quickly than others as the price of crude fluctuates. Verisk’s steady stream of growth may be more volatile in the future. 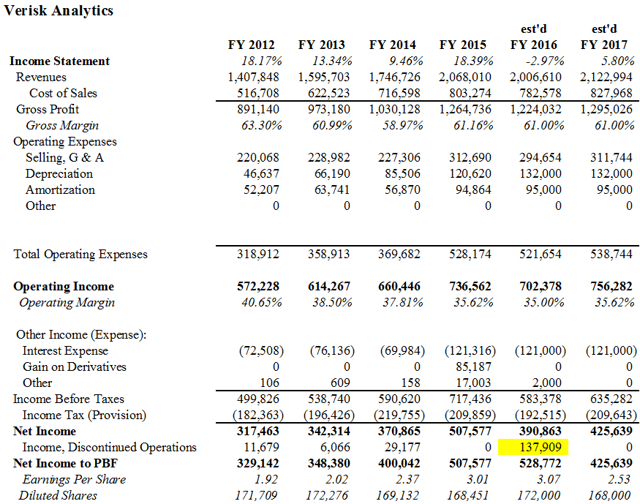 Slightly less than 20% of revenues come from Wood Mackenzie. 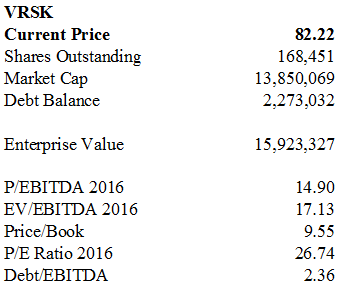 VRSK does have a debt level in excess of 2.2 times EBITDA. At the end of June, VRSK had $2.27 billion on the books, an increase of $1.2 billion from 2014 following the Wood Mackenzie acquisition. Debt levels would have been higher but for the sale of the healthcare analytics business during the second quarter which allowed VRSK to pay down its revolver line by about $600 million. Management is determined to hold the line on debt at a steady state level of 2.5 times EBITDA. VRSK will continue its acquisitive ways and liquidity is essential for growth. After growing 18% in 2015, revenues will likely decline in 2016 by about 3%. This excludes the six months of revenue from the healthcare segment that will post “below the line” as income from discontinued operations. With the British pound flattened, it will be 2017 before meaningful top-line growth is restored. Analysts are projecting a 6% increase to $2.1 billion next year. 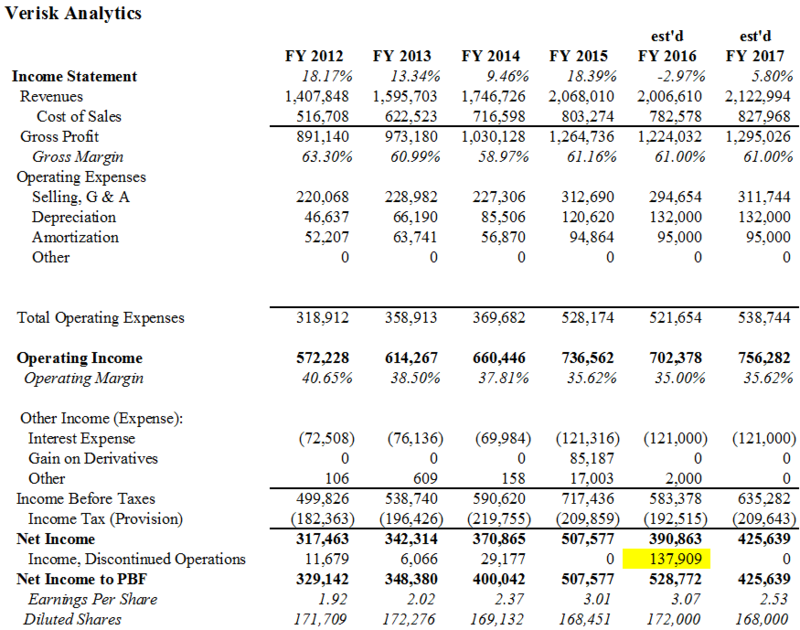 Still, the company should generate over $500 million in free cash flow next year. The valuation looks a little high right now. VRSK trades at 27 times earnings and 9.5 times book value. 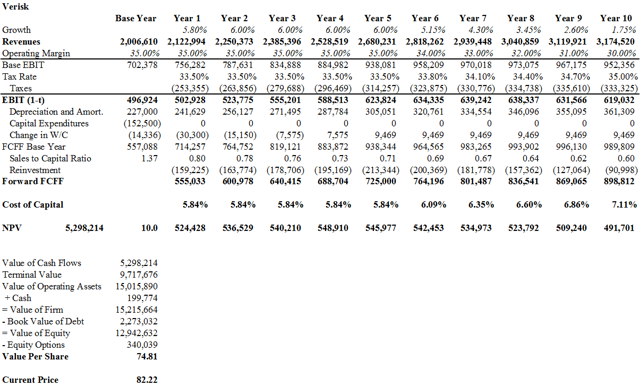 The pretax operating earnings yield from continuing operations is a paltry 4%. However, returns on capital are in the mid-teens and operating margins are above 35%. I ran a discounted cash flow analysis and arrived at a value of $75. It’s more than I’d like to pay, but not out of the realm of reason if considered as a long-term holding. Would I rather over-pay for a great business or try to wait for a lower price? I will admit to a “fear of missing out” mentality, but I tend to lean towards the side of investing in spite of some downside risk. I believe the long-term value will emerge as cash flow improves and future acquisitions appear. 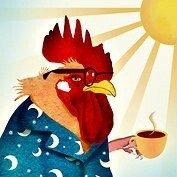 I am going to wait until after the November 1 earnings announcement. I do believe there may be some disappointing numbers as a result of dollar/pound strength that may chase away some bulls. Ultimately, though, Verisk is an investment that will prove to be profitable. I have attached my discounted cash flow analysis for your consideration. I use a weighted average cost of capital of 5.46% and a revenue growth rate projection between 6% and 8% over the next several years. Operating margins of 35% are employed – consistent with recent performance. Disclosure: I/we have no positions in any stocks mentioned, but may initiate a long position in VRSK over the next 72 hours.